An illustration of the three neutrino mass states and the three flavors that make them up (electron, muon and tau), as they were previously though to mix. 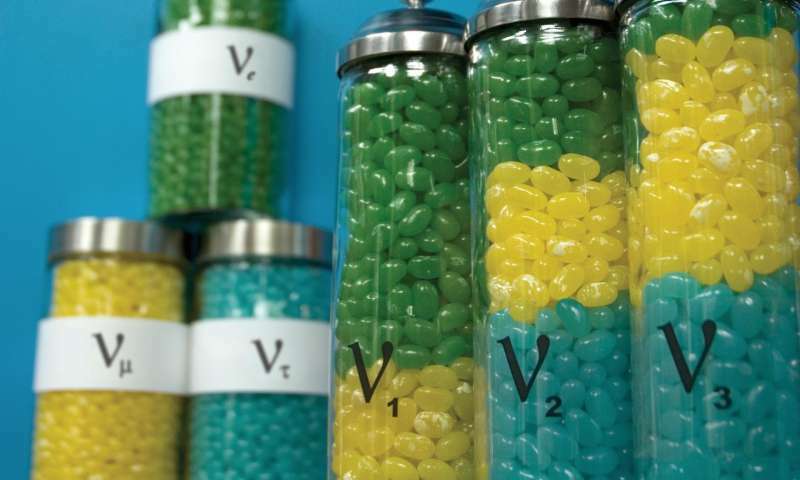 NOvA's new result shows that the third mass state may not have equal amounts of muon (yellow jellybeans) and tau (blue jellybeans) flavors. Credit: Image: Fermilab/Sandbox Studios. Neutrinos have previously been detected in three types, called flavors - muon, tau and electron. They also exist in three mass states, but those states don't necessarily correspond directly to the three flavors. They relate to each other through a complex (and only partially understood) process called mixing, and the more we understand about how the flavors and mass states connect, the more we will know about these mysterious particles. As the collaboration will present today at the International Conference on High Energy Physics in Chicago, NOvA scientists have seen evidence that one of the three neutrino mass states might not include equal parts of muon and tau flavor, as previously thought. Scientists refer to this as "nonmaximal mixing," and NOvA's preliminary result is the first hint that this may be the case for the third mass state. "Neutrinos are always surprising us. This result is a fresh look into one of the major unknowns in neutrino physics," said Mark Messier of Indiana University, co-spokesperson of the NOvA experiment. 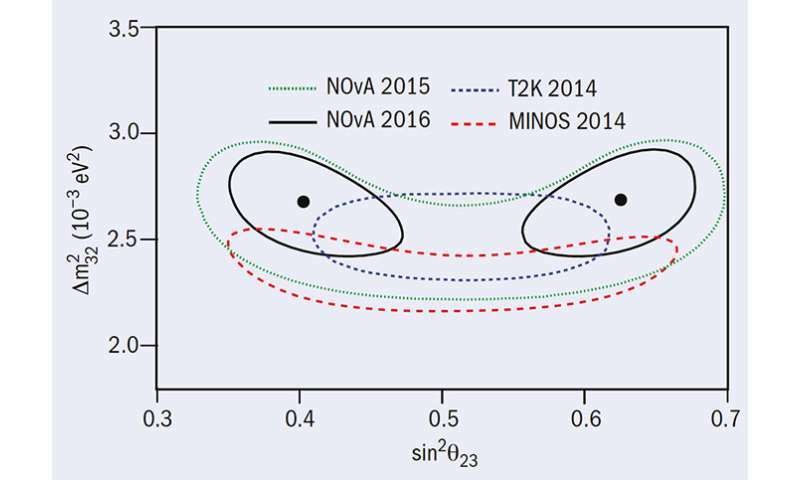 The NOvA experiment's preliminary result shows an equal possibility that the third neutrino mass state is dominated by either muon or tau flavor. Credit: Image: NOvA collaboration. The NOvA experiment, headquartered at the U.S. Department of Energy's Fermi National Accelerator Laboratory, has been collecting data on neutrinos since February 2014. NOvA uses the world's most powerful beam of muon neutrinos, generated at Fermilab, which travels through the Earth 500 miles to a building-size detector in northern Minnesota. NOvA was designed to study neutrino oscillations, the phenomenon by which these particles "flip" flavors while in transit. NOvA has been using the oscillations of neutrinos to learn more about their basic properties for two years. The NOvA detector is sensitive to both muon and electron neutrinos and can analyze the number of muon neutrinos that remain after traveling through the Earth and the number of electron neutrinos that appear during the journey. The data also show that the third mass state might have more muon flavor than tau flavor, or vice versa. The NOvA experiment hasn't yet collected enough data to claim a discovery of nonmaximal mixing, but if this effect persists, scientists expect to have enough data to definitively explore this mystery in the coming years. "NOvA is just getting started," said Gregory Pawloski of the University of Minnesota, one of the NOvA scientists who worked on this result. "The data sample reported today is just one-sixth of the total planned, and it will be exciting to see if this intriguing hint develops into a discovery." NOvA will take data with neutrinos and antineutrinos over the next several years. With both detectors running smoothly and Fermilab's neutrino beam at full strength, the NOvA experiment is well positioned to illuminate many of the remaining neutrino mysteries. If you're referring to asymmetry findings, not much can be done until 4-5σ confidence levels arrive. That's many years away. Are you serious? Neutrinos are elementary particles in their own right and have nothing to do with EM. It isn't EM, it isn't a wave. It is a lepton of the weak force. Give me an acceptable proof. Recall, the SM began with a Glue-On! How do we observe and measure their properties if they have nothing to do with EM? Indirect measurements are, in fact, measurements. I remind again of the trivial example of taking temperature. You do not measure the energy of a container of gas, count the number of particles in the container to find the entropy and calculate temperature. You put a tube of liquid or a metal strip into the container and see how much it expands or contracts by. Material expansion/contraction is an *indirect* measurement of temperature. Neutrinos, like so many other particles, are detected through such kinds of indirect measurements. Missing energy from nuclear decays, very rare 'bumps' with charged particles that then emit energy of their own corresponding to the bump they received. Modifications to nuclear decay rates in the presence of (assumed) greater neutrino density. Etc. We see them only when they interact by the weak nuclear force (as pointed out by danR). As neutral particles they do NOT interact by EM. bschott, in pretty much all physics beyond classical, literally the only thing that matters is whether you can predict the outcomes of an experiment. Some people call this the "Shut up and calculate" philosophy of science. If you take some ideas that are pretty reasonably grounded in classical mechanics(what a field is, Noether's theorem telling us about conservation laws) it turns out you can use the same family of maths to predict experiments that don't have classical analogues. When you work through the maths, you get terms that look *an awful lot like* particles being created and moving about, exchanging momentum from place to place. So as a bit of shorthand, philosophically, we take the maths at face value and just call the bits that look like particles 'particles.' Now, it turns out that making this assumption is pretty justified, because you can verify that something like these particles exist in different experiments. If you don't want to believe that any of this physics is 'real' because you don't understand the experiments or underlying theory, you'll probably be fine for nearly everything in your life. But this is ostensibly a site talking about scientific physics, so we must assume *a priori* that we accept the tools and techniques of modern physics as a part of the discussion. If you don't want to accept them, again, fine. But you're not tilting at physics then, you're tilting at some mock science you made up with whatever holes you want to include, and again, it's absolutely no wonder you don't believe in it, because it's not logically tenable. But don't for a moment think you're delivering any crushing blows or revolutionary insights about physics because you haven't displayed even the basic understanding to land a solid critique of an actual position within the field. Can you even cite the mechanism at play when a neutrino FINALLY does react despite billions per second NOT reacting? that is, by definition, pseudoscience, not science as you can't actually validate your claims with any reputable evidence but claim it's "real"
Well, I might sound like Tweedledee arguing with tweedledum; but, I don't accept modern physics' theories, axiomatically. juz say'n. 1 I can show that the speed of light is not a constant, empirically. Emitted wavelength divided by time to pass a moving object, don't be confused, the wavelet does not change. Silly you would need a stationary measure at the same location for verification, yet still argue space and time changed. 2 The standard model can easily be shown to be unnecessary and insufficient, i.e. proof: False. A neutron is not a particle, it is a proton and an electron combination. Thus the provider of the "glue" for holding the nucleus together. 3 A particle is not defined or demonstrated, only measures that are easily defined with EM. You really need a description of Truth? OK. Then show it, empirically or any other way you want to try it. The rest is scintific word salad (i.e. meaningless). Again, prove it! Random spurious claims are not likely to convince anyone visiting a real scientific website. I am afraid this last point makes no sense whatsoever, so I am unable to comment. I don't see a valid argument. Something like "We are absolutely right about what we do not know, and you are wrong, trying to use known physics and common sense." Are you kidding? so, what can i get from you if i could take you to any local region of space and demonstrate where it's not "filled with plasma"? care to put actual money on the table for that one? ... it's not about what you can claim, it's all about what you can prove, and you're making what is called "false claims"
"So none of these arguments are valid. juz say'n again"
You could have just said, "I don't get it." The "I" could be either you or me, reference Conan Doyle, Tweedledee and Tweedledum, i.e. acceptable logic, so the dummy does not accept logic. Therefore the argument continues ad infinitum. Review the paper, again. Ponder the spherical field about the electron or the proton. At what measured minimum distance is it Not there? Anyway, plasma does not fill space it exist in space and is very plentiful. Did not know I had to use formal logic in my conversational logic for my statements Anyway, try harder, your rebuttal is too emotional. So is a particle a solid, liquid, gas plasma, or condensate, and does it occupy space, these are elemental. Show me the proof. My position is all particles are elemental and occupy space exclusively due only to repulsion. But you seem to think each particle has an impenetrable boundary, LOL. Try to be scientific, and question, not demand, truth. Think we need to define definitions. In my world a particle is elemental, i.e. may be shown to possess at least one element. Subatomic particles are not particles at all, a misnomer. The electron and the proton are defined by Maxwell and are called charges, not particles. But any redefinition that won a Nobel, i.e. Leptons, etc. was last century, forgivable, but not correct. My proof, or call it a conjecture, is everything is made of electrons and protons, and I consider only the spherical field until an existence proof is given. That does not make any sense at all. In my world a particle is elemental, i.e. may be shown to possess at least one element. This is a self contradiction within the space of one sentence. How can something be elemental if it can have more than one element. Nonsensical. You're just relabeling stuff from the accepted definitions. Nonsensical. Not even a grammatically correct sentence. Nonsense. is everything is made of electrons and protons, and I consider only the spherical field until an existence proof is given. You made the conjecture so YOU need to supply the proof. Otherwise (you guessed it): Nonsense. care to recreate all the historical experiments that you seem to be ignoring for your belief and proselytizing of your delusion here? Dude, why do you argue without logic or science and using papers but never supply an axiomatic structure to support any thing you say. It's just trying. We can't talk about science when all you want to do is state denial, without any support, i.e. using what we are trying to correct without any reasons of your own, only denial. Can't you see Einstein's error, or the error in the standard model. Dr. E has a false axiom, the same axiom everybody uses as defense. I show the axiom as false, but it's denied. The standard model has an unknown reason for existence, i. e. Glue-Ons hold the nucleus together, completely bogus. We use words that are not defined axiomatically, only definition of a particle is simply if we talk about crumbs in your plate, not subatomic. So I can only conclude you don't have the will or maybe the intelligence. .........why take the bother, even you don't understand the links you Copy & Paste. Ever try having a conversation with walls being the only thing surrounding you? What link. Does it give the axiomatic structure of each particle? This way, we can make sense from the data. Do you use Newton's undefined constant, mass; and reconcile where gravity is coming from? Do you define the particle's attributes other than an EM measurement? Do you define a set of objectives, methods, experiment, conclusions? You don't just label data and give it a name, do you? That is a set of things we can apply as the scientific method. What is the proposition? Do we show the contrapositive as false or that there are no other causal effects, i.e. necessary and do we show how holistic, i.e. sufficient. That is per the Formal Logic. Or do you use another logic. Do you define the universe of discourse? Show me something. What a load of rubbish you talk! As soon a you are cornered you come out with another load of meaningless nonsense in an attempt to hide it by diverting peoples attention. I does not work! OK, you win. I'm an idiot, you are a genius. I should listen to you for all things physics. I have no idea what physics is or am completely without logics. I choose only nonsense as my modus operandi. I must have been born with a lack of oxygen. I'm not human. I'm a monkey that throws $hit to make my point. I have nothing worthwhile to offer. I was kidding myself to think that I even had a chance when I chose to try and run with the big guys. I'm simply lost in a big ball of Higgs Bosons. Here, elemental refers to the actuality of all real particles. There are no particles that can be defined that do not contain at least one element. Charge is not a particle, it is only a field. This field is a constituent of all particles. A particle has substance and occupies space. A charge does not. Mass is an unknown constant. Using mass to define mass is illogical. But what do I know. I'm an idiot. Day #6953. They still answer to trolls and crackpots. is that "axiomatic" enough for ya? I am not the one claiming to be a genius. YOU ARE! If I am not knowledgeable in a subject I trust in the judgments of those that are, or learn more about it. You, on the other hand, claim to know better than ALL the scientists that precede you and refuse to learn more. Evidently RNP belongs to the same sockpuppet army as HF. It joined 5 days ago. Can't find any ground, you dis' I'm an idiot; but continue this diatribe. If you're too stupid to see that the emitted wavelength doesn't change and the time to pass yields the speed of the wavelet; then, go back to grade school. If you think Gluons holds the nucleus together, you become a fool. So please simply leave me alone. You've made your idiot point. Your redundancy is borderline insanity. So give it up. I'm never going to agree with stupidity, no matter who tells me. IOW- "you become a fool. So please simply leave everyone else here alone. You've made your idiot point - you don't know WTF is going on. Your redundancy is borderline insanity. So give it up. I'm never going to agree with stupidity, no matter who tells me. "What people believe prevails over truth."